Perhaps one of France’s most breathtaking castles, this beautiful grey stone structure appears to be floating on the placid waters of the Indre River. Built between 1518 and 1527, Chateau d’Azay le Rideau was once considered the premier example of French renaissance architecture. In 1905 it became a designated historical monument and later, the castle was included in the Loire Valley UNESCO World Heritage site. After taking in the impressive exterior, travelers can explore the rich interior, which is comprised of old-world drawing rooms, apartments, a kitchen and bedrooms decorated in 19th-century style. In addition to being a stunning example of French architecture and history, Chateau d’Azay le Rideau is also home to a large collection of artwork. Chateau d’Azay le Rideau is located in Azay-le-Rideau in the middle of the Indre River. Visitors should be sure to check out the chateau’s attics, which are renowned for their impressive hand-crafted wood frames and a unique exhibit detailing the challenging construction. 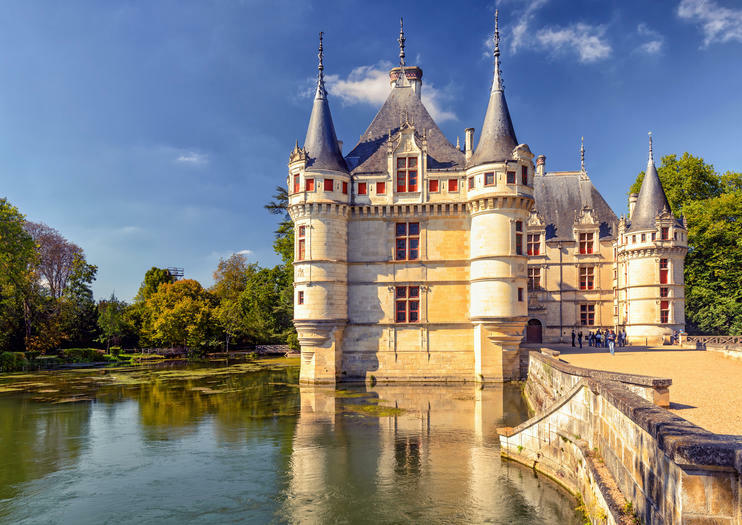 A two-day tour from Paris with private car (pick up at your hotel / flat) with our english or spanish-speaking guide to discover five Renaissance castles (XV-XVI century) along the Loire River, Azay-le-Rideau, Chenonceau, Amboise, Chambord and Cheverny. The Tour includes a night with breakfast at a hotel ** in Amboise. Tickets, lunch and dinner not included. Pick up at your hotel. A single group, exclusive attention of the guide.